Do you ever stand in front of your fridge and think there’s nothing to eat? I sure do, and having a few back pocket meals in place like maple glazed pork chops or Instant Pot honey garlic chicken or slow cooker beef ragu or even kung pao chicken with a bag of frozen vegetables is super handy. 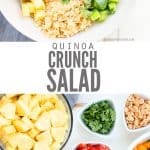 Now that I found a way to make quinoa that I actually like, I’m declaring this crunchy vegetable quinoa salad as back pocket worthy for warm weather! Now, I admit that you usually don’t hear “quinoa” and “salad” together in the recipe name. Or even in the same sentence. I mean, how often do you hear “rice salad” and think good, yummy thoughts? My point exactly. So let me explain what exactly quinoa salad is. Quinoa salad is a meal where quinoa is one of the main ingredients. It’s definitely not the only ingredient, and it may or may not be served on a bed of lettuce. It also has a sauce that is PACKED with flavor. This particular crunchy vegetable quinoa salad is not served on a bed of lettuce. It’s served in a bowl and drizzled with my BFF sauce, Thai peanut sauce. 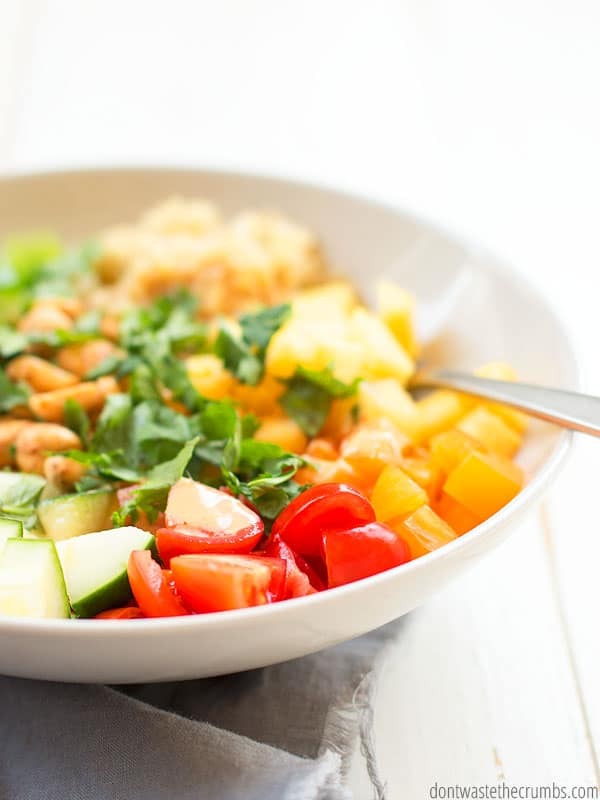 Friends, if you haven’t tried my Thai peanut sauce yet, you are missing out! This may be a no-brainer, but you’re starting with an incredibly healthy grain. 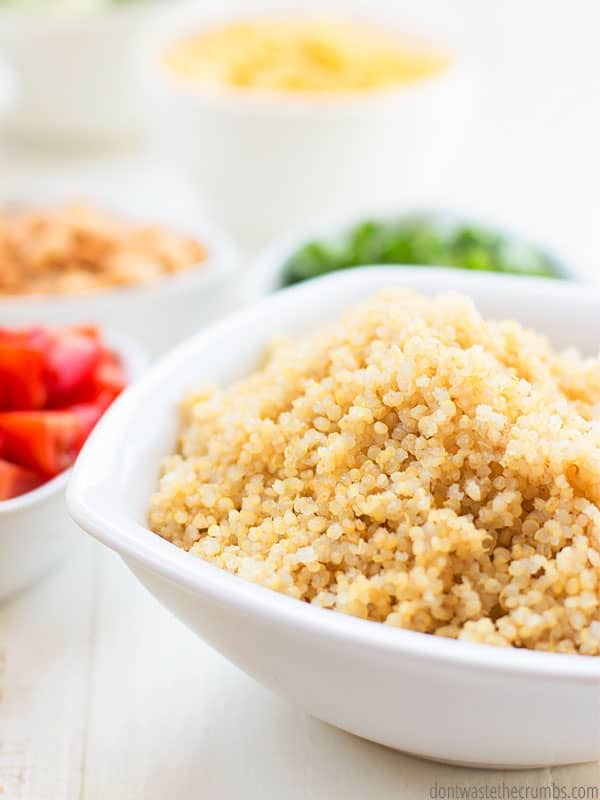 Quinoa is naturally gluten-free, high in protein and easy to find at the average grocery store. It’s also SUPER FAST to make – it takes just one minute in the Instant Pot! What’s even faster though, is making a massive amount of Instant Pot quinoa and freezing the leftovers. 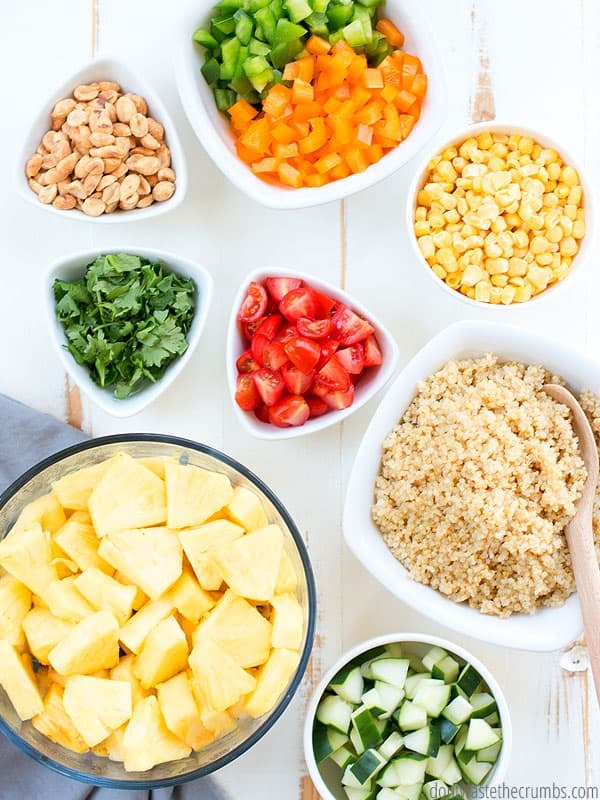 Then you can make this crunchy vegetable quinoa salad recipe without actually cooking anything! 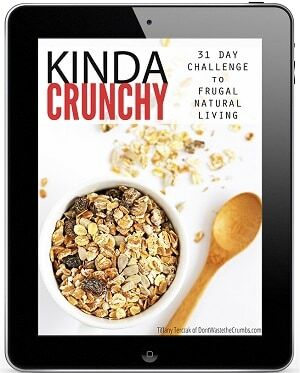 You add whatever crunchy vegetables (and fruits!) you have. Obviously, I gave you a starting point with the recipe below, but I’ve made this crunchy vegetable quinoa salad dozens of times and it’s never been the same thing twice. Because I’m tailoring it to work with whatever I have on hand, at the time. Out of bell pepper but have zucchini? Do it. Out of cucumber but have kale? Do it. No carrots but have broccoli? Do it! Basically, you do you. The only guideline I’m going to give you here is that make sure that A) you actually like the vegetables you put in the salad, and B) the vegetables are crunchy. When you toss all these things together in one big bowl, you don’t want any soft vegetables, like avocado or cooked squash, to get muddled up in the process. Whip up a batch of Thai peanut sauce. You guys, this sauce is goooood. So good. And super versatile too. If you don’t have peanut butter, use almond butter. Use a different vinegar and skip the sugar and sub lemon juice for lime… whatever. Do what you have to do to MAKE THIS SAUCE HAPPEN. I promise you won’t regret it. 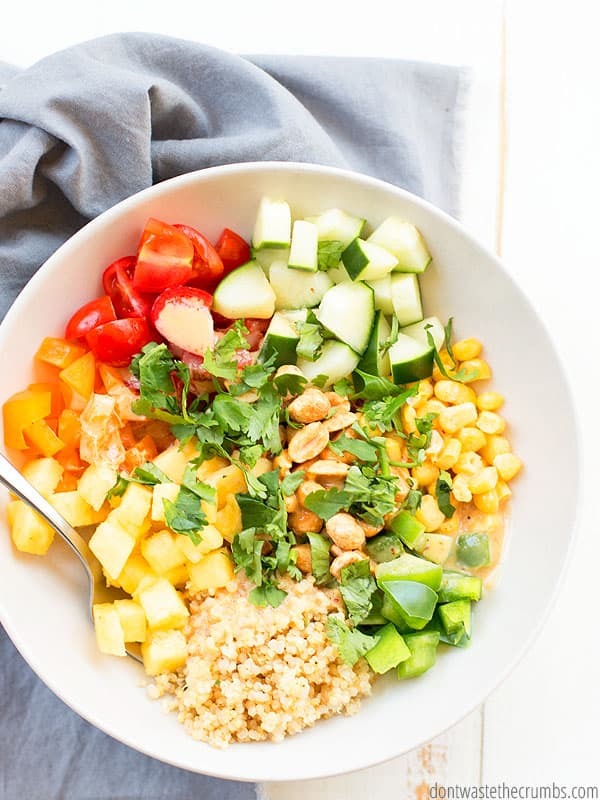 This last step is entirely optional, but we like to sprinkle peanuts on top of this crunchy vegetable quinoa salad, just because we can. 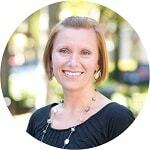 My husband has sprinkled cashews before, and I think I did pepitas (hulled pumpkin seeds) one time too. Sunflower seeds, walnuts, pecans… the pantry is the limit here guys – use what you have! We usually leave the meat off of this quinoa salad to keep our grocery budget in check (so we can afford grass-fed and pastured meat from Butcher Box! ), but you can definitely add meat if you want to. 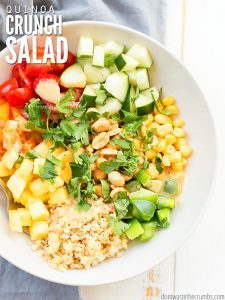 Shredded chicken (cooked in the slow cooker OR in the Instant Pot OR roasted in the oven) or cut up smoked sausage or even steamed shrimp would all be really good in this quinoa salad! Seriously, nothing calls my name more than a dinner that’s already done for me. You can totally pull this off with this quinoa salad, too, just keep the quinoa, vegetables and sauce all separate. If you want some leftover for lunches, dish some out BEFORE you dress the salad with the sauce and pack the sauce separately. It’s worth to be called a meal. You know how some salads are kind of wimpy? They sound good, but you rummage through the pantry because you felt like you ate a few blades of grass and you’re still hungry? That’s not this salad. This quinoa salad will FILL YOU UP. Plus the recipe as-written makes a lot, so feel free to enjoy seconds! It’s a perfect end-of-the-week “use it up” meal. When you need a meal to use up all the randomness going on in your refrigerator before you can go shopping again, this is your go-to salad. Minestrone soup is a good option too (with a side of no-knead bread – YUM! ), but going back to the whole weather thing, I prefer cold food when it’s hot outside. Chop all of the vegetables as necessary. Combine the quinoa and vegetables in a large bowl and toss together well so everything is evenly distributed. Pour about half of the sauce over the salad and toss again very well. Taste, adding more sauce if desired. Sprinkle with peanut and cilantro and serve. 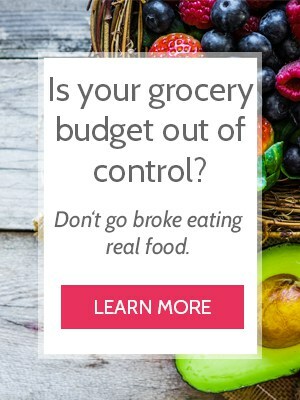 Are you looking for other ideas for real food spring meals on a budget? 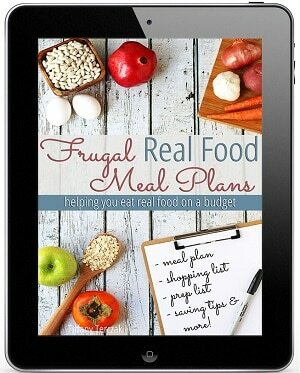 Check out my Spring Frugal Real Food Meal Plan eBook. 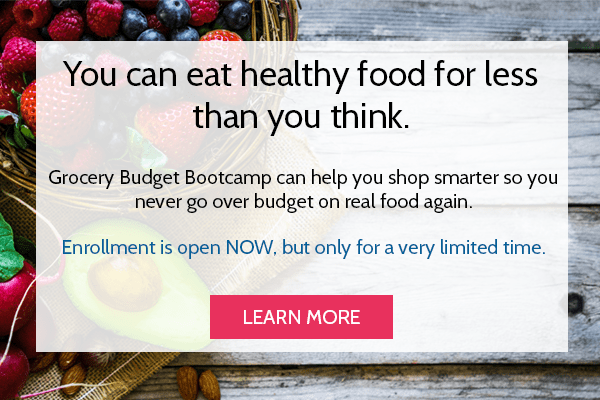 This gives you THREE MONTHS’ worth of meals— real food meals on an affordable budget! 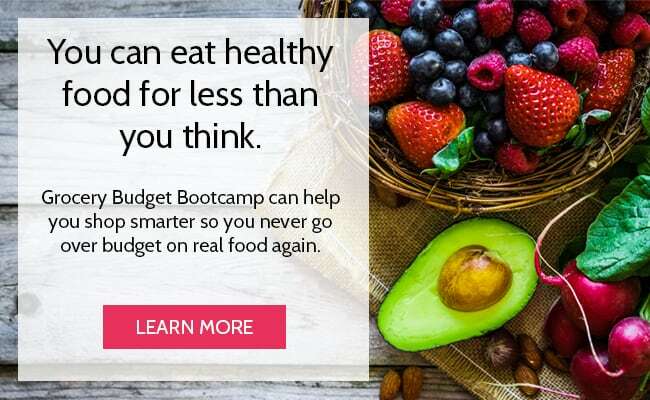 The hard work has been done for you, which includes grocery lists and recipes, along with a few shopping tips and ways to save even more on your groceries. Have you ever had a quinoa salad before? What are your favorite flavors in a salad? Do you like hearty salads, or light salads? Leave your thoughts in the comments section below!